If you are new to taking fish out of the water, then you need to realize that people who do this sport have their own language. Therefore, you might want to practice your fishing terminology before you get on the boat. An angler is an educated fisherman. While a fisherman goes out and tries to catch fish with whatever bait might be available, an angler actually tries to use certain types of bait to hook particular species of fish. Angling does not refer to the car that is parked weirdly in the parking lot next to you causing you to want to wonder if they got their license from a box of Cracker Jacks. 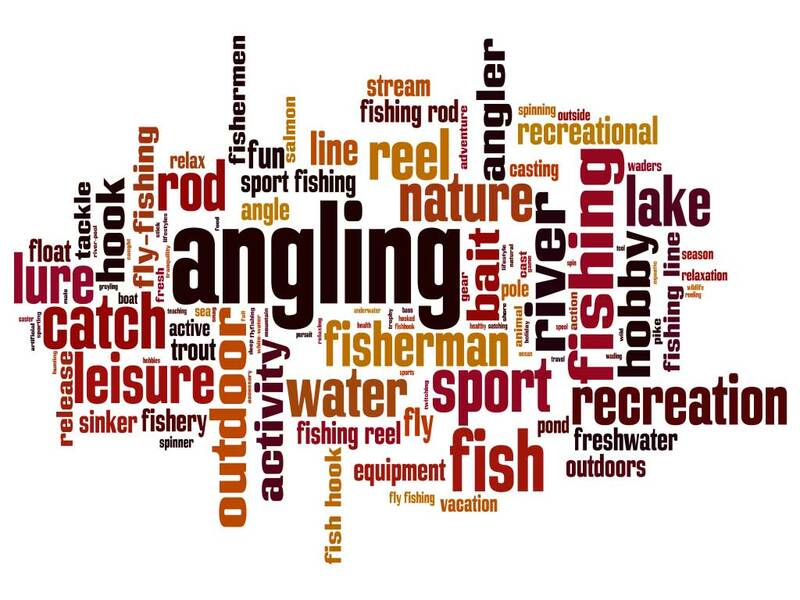 Instead, it refers to the sport of catching fish with a rod. While you may need bail money if you do not follow the laws while you are in the boat, most anglers use the term to describe the u-shaped pivoting part of a reel used to rewind the line onto the spool at the end of your pole. If you hear your captain yell bail, however, you will want to grab the closest bucket to help remove water from the boat. If you have to use this dictionary, then you might want to avoid a baitcast reel as it is considered the hardest to control. On these reels the spool turns. If you do not control the spool, you end up with a nasty mess of line ruining your beautiful day on the water. Catch and release is not a new fangle football play nor is it a movement that police use when they catch the wrong person. Instead, catch and release refers to catching a fish and throwing it back into the water so that you or someone else can catch it again a different day. We definitely want you to brag to your chums about your great day with us. While you are fishing, however, a chum refers to fish parts, bones and blood thrown into the water to encourage fish to bite. While you may be guilty of baiting your kids to the point that they get cranky, that is not the definition of the term while you are angling. Crankbait is a lure that goes under the water and stays there until a fish decides to eat it allowing you to catch them. You may have seen a man dressed as a woman on your last drinking spree or thought that reading Shakespeare in high school was boring, but neither idea defines drag for anglers. Instead, the term refers to a pair of friction plates located inside the reel helping you control the big fish and keeping your line from snapping until you can get the fish in the boat. The last time a driver cut you off in traffic, you might have wanted to perform a flipping action at them. When you are out on the water, however, flipping is the presentation of a lure in the water about 10 to 20 feet away from you in a way that fish will be more likely to bite on it. You may want to dance with quick little steps when you cannot find the bathroom or your significant other may want to go out to dance this step. Neither definition, however, is correct when you are angling as the term means a lead sinker with a hook molded into it. Lipping does not refer to what to do if the big fish breaks your line. Instead, it refers to immobilizing a fish by placing your thumb over a toothless fish’s mouth. While you may wish that everyone lives well, livewell is not used as a greeting by anglers. Instead, it is a tank where bait or fish are held to keep them alive. There is no doubt that Sandy Koufax, Roger Clemens and Nolan Ryan were great at throwing the ball, but we do not know if they were great at making the lure enter the water quietly which is known as pitching to anglers. The boat needs plugs and so does your car. Anglers are usually talking about a hard-bodied lure when they use the term plugs. The person making popcorn may be referred to as a popper, except when an angler uses the term because they mean a hollow-body ure staying on top of the water. While it may be funny to watch Bob slip unless he gets hurt, and then it is hilarious, a slip bobber is a plastic piece moving freely up and down your line helping it function properly. You might want to cry when they get a snag in their favorite pair of pants, but to anglers catching a fish without the fish biting the hook is snagging. You may think that a spincast reel is the hottest dancing step,, but it is really a reel on the end of a spinning rod. While you may be tempted to put a spinning flytrap up as a spinnerbait, when you are angling, remember that it is a lure with metal blades designed to spin. If you go to the target range, do not put split shot in your gun. Instead, reserve these small pellet-shaped pieces as weight on your line. If you hear the captain ask for a spoon, do not think you need to go to the kitchen. Instead, hand him an oblong lure shaped like a spoon. If you are following someone on social media, then you are trolling. If you are in a boat, however, then you are pulling lines designed to catch fish behind a moving boat. Call one of the guides in our directory to set up your charter fishing trip, now that you know the correct fishing terminology. Party Fishing Boat: When Should I Consider This Option?